Who doesn't love free gifts? 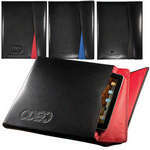 Make your customers and potential customers happy with our upscale personalized writing tablets and iPad holders. Our promotional writing tablets are functional, well-made and -- best of all -- affordable! All you need to do is pick which one fits your company's needs. 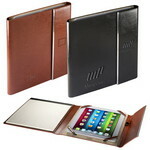 At Promotion Pros, we take pride in offering tons of choices, and our logo iPad holders are no exception. Whether you want a leather portfolio with tablet case, a Manhasset portfolio, or custom leather iPad case, we've got you covered. This Portfolio tablet case to hold your iPad or tablet features a cowhide leather pad with ballistic nylon trim and 210d nylon interior for styling and safety. The Fairview™ Portfolio with Tablet Case includes a front pocket for your tablet, business card pocket and an elastic pen loop. The Manhasset Portfolio and iPad Holder is a classic and is designed for professionals who are always on the move. With your logo neatly imprinted on this masterpiece for maximum visibility, it makes for a fabulous giveaway to all your premium customers to ensure continued business. Get classy with the Vienna™ Tablet Portfolio. 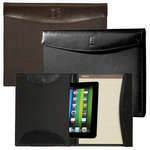 The Portfolio is made from glazed faux leather iPad/tablet holder with metal trim. Our deluxe cd padfolio features a built in zippered pocket, business card holder slots and makes a wonderful corporate gift.